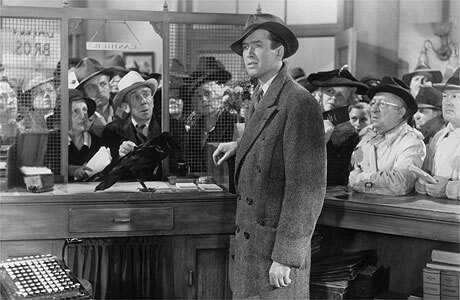 Jimmy Stewart in It's a Wonderful Life, during a run on his savings and loan. A group on Facebook has announced that Nov. 5th is Bank Transfer Day. The idea is simple: take your money out of the sprawling, corporate monstrosities called banks and move it to localized, community oriented credit unions or small banks. If saving is agreed to be a valid effort, the practices surrounding its use should reflect the precautions mentioned above. When determining where to save one’s capital, for example, one should take care to store and invest it in local, independent institutions so as to reduce the Juggernaut footprint created. These days, as we have found, simply storing income in a bank can fuel extremely risky financial behavior that will ultimately end in disaster. As explored above, the moral hazard established by the FDIC and other governmental insurance programs means that people are inclined to freely stash their money in banks without doing any research to determine what those banks intend to do with their money. To the depositor, it doesn’t matter what happens because he will get his money back regardless of whether the bank uses it to invest in collateralized debt obligations or in velvet Elvis wind chimes. If, on the other hand, depositors were more discerning with their money, the banks would be as well. After some research, a prudent investor might still find his bank the safest and most reliable place to store his money. At the same time, another investor might discover new institutions that are safer and more reliable to invest in—for example, banks with 100% reserve requirements to ensure that a depositor’s money is not used in subsequent, potentially risky, investments. Still others may choose to invest in sound, long-term commodities like gold or silver. In most cases, the prudent investor would presumably try to keep his wealth closer rather than frivolously spreading it across the economy as is most often done these days. An individual or family should save their money just as they would save any other valuable, id est, in a way that will not allow it to be used in risky endeavors. A Bentley owner wouldn’t let a friend borrow his car for a road trip to Tijuana, for instance, so neither should the owner of a few hundred thousand dollars let a bank borrow it for a sub-prime mortgage-backed security. It is not easy to identify all the activities a bank engages in, and it is even more difficult to gauge the risk level involved in them. But there are certain banks that stand out above others as more cautious and responsible. Banks that needed the TARP money included in the financial bailout—Citibank, Chase, and Bank of America, to name a few—are good examples of high-risk institutions. Unless they have changed their ways, these banks should probably be avoided. On the other hand, banks that declined the TARP funds, such as regional institutions Frost (Texas), First Commonwealth (Pennsylvania), and Kearny Financial Corporation (Northeast), among others would be good places to store money. Naturally, smaller, local banks have some drawbacks that might not be acceptable to the individual or family trying to make the most of their money. Larger banks often provide their customers with a good variety of services including ATM access, high-yield savings accounts, online banking, and so on. BB&T, for instance, which is a large bank that was forced to accept TARP funds though it didn’t need them, only serves the American Southeast and does not refund ATM charges collected by other banks. The smaller the bank, the less likely it will be able to afford such features. If a bank is not investing its deposits in securities, its savings program will probably not offer a return and may instead charge the depositor a monthly fee. Since the bank is not making money on its deposits, it needs additional income to cover its expenses. And yet there are banks that do provide many of these services, and the depositor willing to perform most of his banking in a local region should be able to find the right bank using services that offer third-party analysis of bank strength and risk level. The Move Your Money Project is a nonprofit campaign that encourages individuals and institutions to divest from the nations largest Wall Street banks and move to local financial institutions. Little has changed to prevent another financial crisis or to end Too Big To Fail, and with Congress unwilling to act, we are encouraging individuals to take power into their own hands by voting with their dollars and no longer contributing to a financial system that has led our country astray. We are a campaign that gives people real, concrete actions they can take to create a more sane, stable and localized banking system. No matter what the means is, the aim is the same: localism, polycentrism, self-sufficiency. This entry was posted in 2007-08 Crisis, Austrian School, Autarchy, Closed System, Competition, Complexity, Culture Divide, Current Events, Economic Theory, Frontier Thesis, Game Theory, Inflation, Inspiration, Interdependency, Motivation, Polycentrism, Resources, Self-Government, Self-Reliance, Self-Rule, Self-Sufficiency, Simplicity, Solutions, Specialism, Systems Theory, Trade, Wealth. Bookmark the permalink.